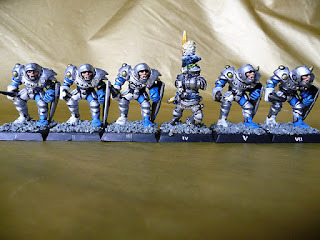 When the Empire army came out for 4th Edition [I've done some research and it was 4th Edition our gaming group purchased] it was all about the Halberdiers. Honestly they were the poster boys for the whole Empire and if not them it was the Greatswords with their ever so great swords they only went and called them 'great'. 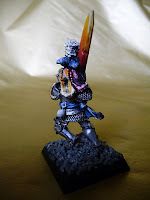 What there didn't seem to be a lot of love for were the common-or-garden Swordsmen because lets face it there wasn't anything special about them... WRONG! Now having never actually played a game I could be totally wrong and they just don't perform but on paper they were exactly the same as their other Empire brethren except for the small fact they had Weapon Skill 4! They didn't have the two-handed drawback of Greatswords and Halberdiers which I recall [but may be wrong] meant they struck last or some other disadvantage but it definitely meant they could use their shields which made them also more durable. Anyway I wanted them in my army so I struck up a plan to get some, cheap. First up however is not a Swordsman, not a true one anyway. 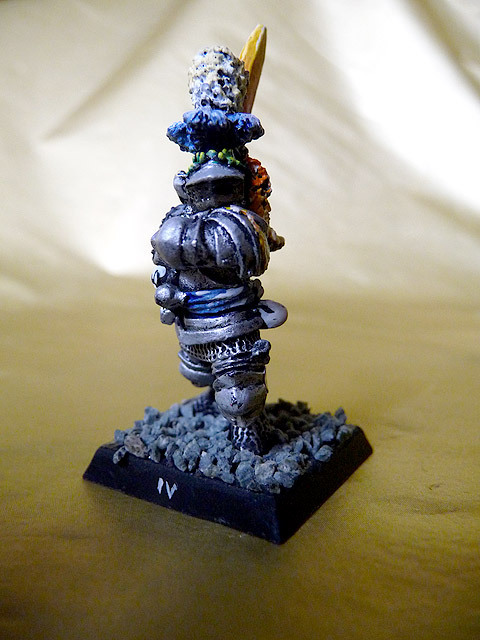 Here's another Marauder Miniature. One from a set of Heroes of the Empire. These guys are massive, super human whirling dervishes of the Emperor Karl Franz's elite foot knights. This fella is clearly running some magical greatsword but we'll gloss over that, he was the low level champion added to a quite small squad of Swordsmen. And here they are [minus number VII], do you recognize them? 2nd Edition Blood Bowl humans. I bought a fair few of these guys and as you can see the early GW plastic moulding which made these oversized Fantasy Football folk actually scale quite well with my Hero. The only issue was the base which wouldn't fit a standard 20mm square base so I had to upgrade them to 25mm square. 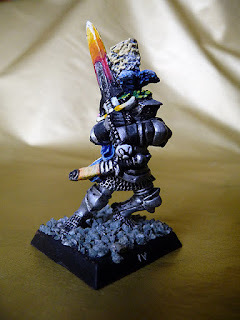 It was a simple conversion, I had all the High Elves from 4th Edition so I removed a load of their spear heads up to the spear shaft, the spear blade was then cut from the cone shaped connector to the shaft. The blade was glued to the front of the hand and the cone on the back as the pommel of the sword. The left arm was snapped above the elbow and glued twisted downwards. The High Elf shields were then glued on the hand and due to their size and gaps in the snapped arm were hidden from view. That's it, simple, effective and cheap, CHEAP, CHEAP!